Collecting seems to bring out that primitive instinct for the hunt in some of its devotees, who stalk their prey with skill. Not only do signs abound, touting “Antiques ” the signs themselves have become valuable collectibles, and we’ll focus on those here. A staple of commerce for centuries in Egypt, ancient Rome, Greece, and throughout Europe, certain signs became associated with certain trades – three balls for pawnbrokers, a bush to indicate a tavern, etc. In 1389, King Richard II of England made it mandatory for anyone selling ale to post a sign, or forfeit his ale. (Signs made it easier for inspectors to find them.) But what if there were six taverns on one street? Often images, rather than words were used to differentiate the establishments – i.e. The Red Lion, the Golden Harp, etc. with many referencing heraldry. Eventually signs were deemed a danger and a nuisance. (Stand beneath one in a high wind at your own peril.) In 1669, a royal order was issued in France against the excessive size and/or projection of signs into the street. Thereafter signs were attached directly to the wall. At one time, everyone from the optometrist to the bootmaker, the haberdasher to the locksmith sported a fanciful sign. 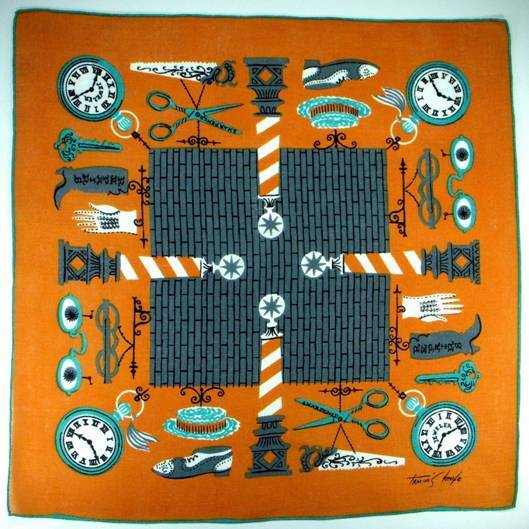 This Tammis Keefe stunner, in pumpkin and gray spiked with turquoise highlights, sports a backdrop of cobblestone streets, underscoring the era when signs reigned supreme. No detail is overlooked – note the tiny hand rolled turquoise hem which offsets and enhances the graphics. A second Keefe creation focuses on foodstuffs, from sudsy brews to ice cream, frankfurters to fish. Note too the false teeth, shaving razor and mug. Trios of electric globes vie for supremacy with gas lamps which anchor each corner in this merry-go-round of visual delights. 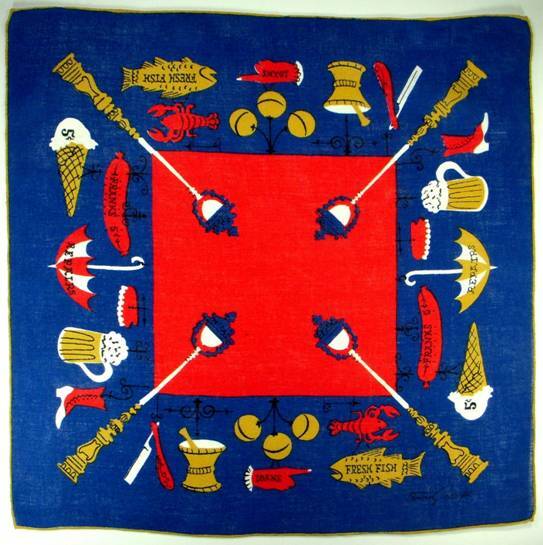 This hankie depicts a sign-packed city street in the 1800’s. 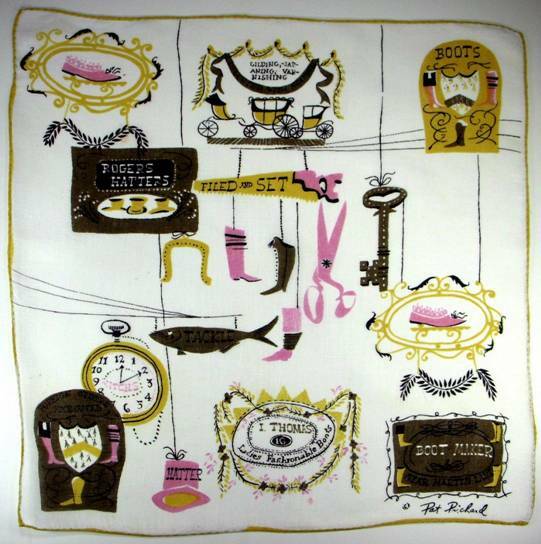 The tumble and jumble of advertising art inundates the senses – from carriage gilding to hatters to custom high button boots. In this era before “off the rack” everything was custom made, took skill to execute, and was highly valued. This terrific tic-tac-toe of signs targets a single topic – hunting. 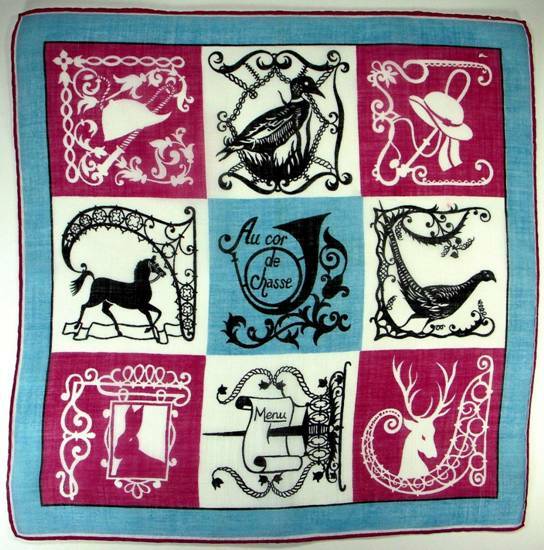 Whether the prey be stag, pheasant, duck, or hare, you’ll find each on the menu in this checkerboard charmer. The elaborate wrought iron work embellishing each image draws the eye in to play and participate. Perfection! 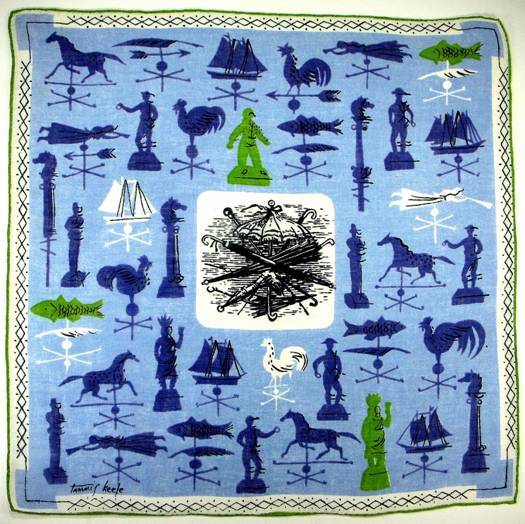 One thing I loved about visiting towns in Normandy in northern France was all the little street signs, many reminiscent of those in this handkerchief. Another well-known sign was the hand carved Indian which stood outside the tobacconist shop. 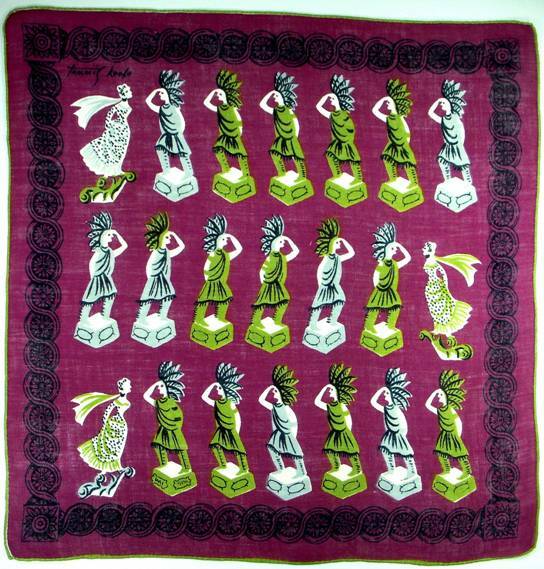 In the aubergine beauty below, stalwart braves are bookended by a female figurehead, her scarf blowing in the wind. Why would they be paired in the same hankie? They have more in common than you might suspect. In fact, life size Indians first appeared on the prows of ships, and only later took to the streets. According to one source* the Cigar Store Indian actually “dates back to 1617 in England, when small wooden figures called ‘Virginie Men’ were placed on countertops” to represent various tobacco companies. Commercial cargo ships carrying Virginia tobacco would often have an Indian figurehead on the ship’s prow to signal what cargo they carried. As steamships replaced sailing clippers, the life size Indians migrated from sailing vessels to standing outside tobacco stores. Why the Indian? Merchants sought memorable images to distinguish themselves from other tradesmen, and history indicates the Native Americans were the first to use tobacco in the Americas. Additionally, by the 1800’s the United States was becoming a melting pot of various nationalities and languages, and it was believed some immigrants might be unable to read the words Tobacconist Shop. Although the early English statues were costumed in tobacco leaves, those carved for the states were often dressed in buckskin and blankets. 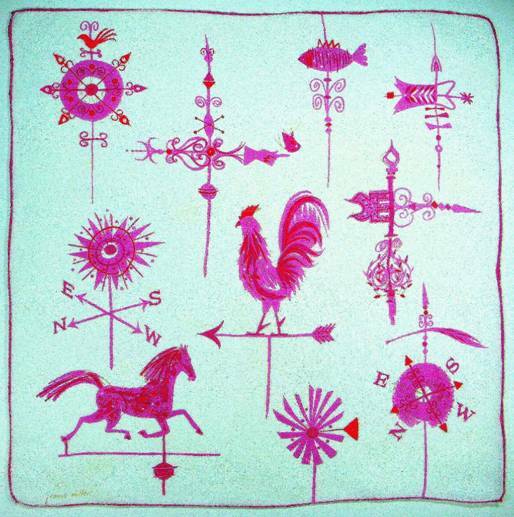 Even folks not enamored with signs are often captivated by the craftsmanship and imagery of weathervanes, many reflecting the culture of the region, from roosters in farm country, to whales on the coast. 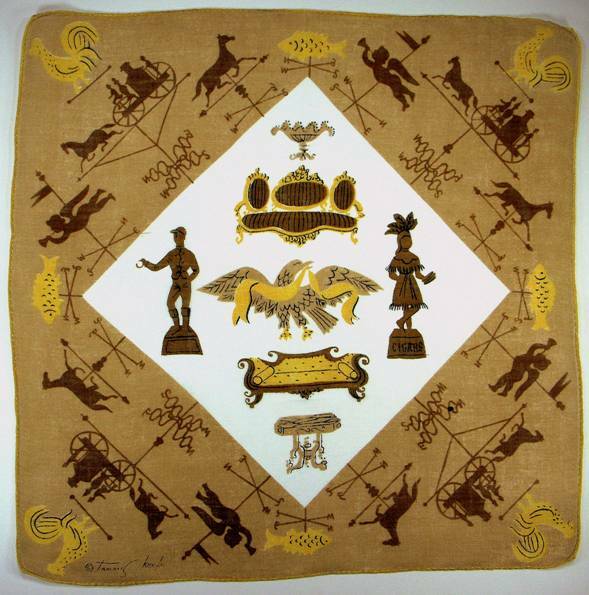 The horse drawn fire engine in the hankie below is a marvelous example of creativity. 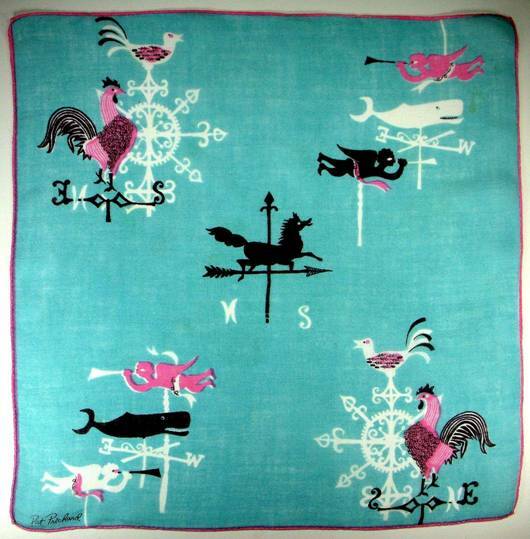 From roosters to angels to galloping steeds, this hankie is awhirl with twirling weathervanes. A handsome collection complete with beautiful compasses. 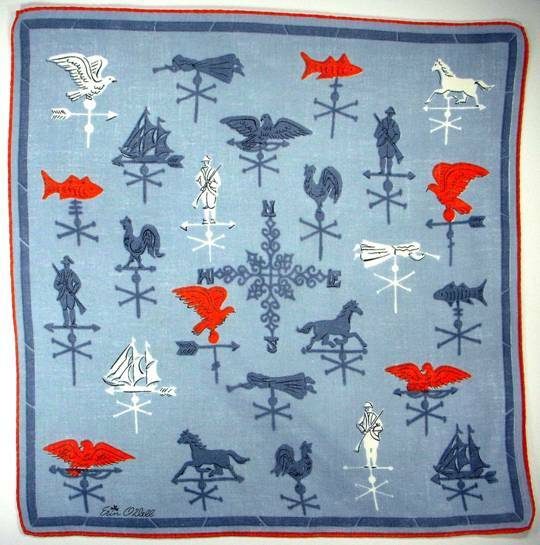 You can’t get more all-American than this patriotic number bursting with American Eagles, minute men standing at attention and clipper ships in full sail. This monochromatic grouping in Schiaparelli pink is fun, fashionable and fantastic. We hope this inspires you to dust off an old collection and see it with new eyes, or perhaps start a new collection of something that has always interested you. Enjoy! What is the most unusual collection you have ever encountered? The most beautiful? The most intriguing? The oddest? One favorite that comes to mind for me was a collection of Sailor’s Valentines fashioned from tiny shells created during the endless weeks sailor’s spent at sea. You can google them; they range from enchanting to astounding. I love all your posts, but this one has to be my favorite !!! Do you have any antique signs or weather vanes? There also must be a history behind your unusual and lovely name.